Having provided temporary roofs for various building types in Brighton for a long time, we have become specialized and well known for providing great service in the area. At Ace Scaffolding, we provide temporary roofing solutions to commercial and domestic clients alike. So, if you’re wondering about getting the right temporary roof system for whatever project you have in mind, then you have come to the right place. Building and refurbishment projects always need two things, time and money. No one wants to be on a project longer than they intend to or spend more money than is in their budget if they can help it. 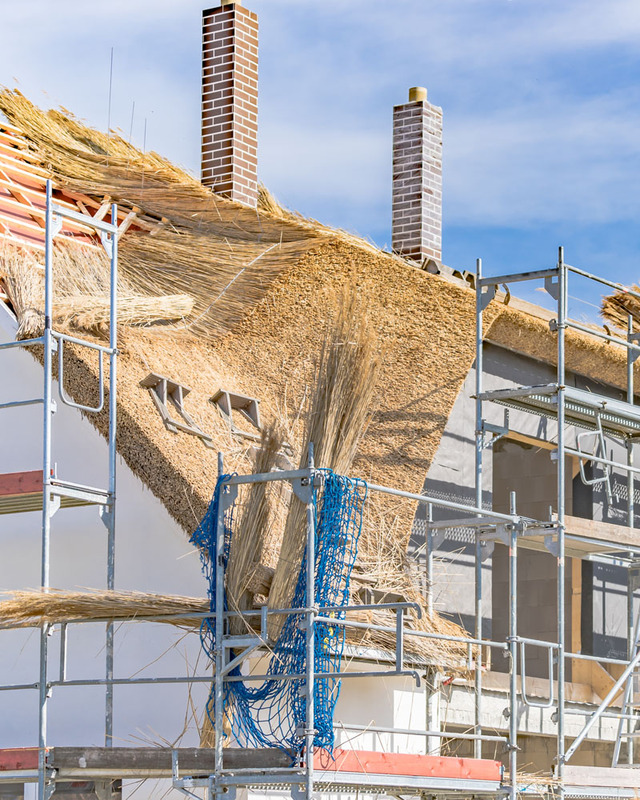 If you have any building or refurbishment project in Brighton, you’re probably considering temporary roofs and we happen to provide a wide range of temporary roof solutions. Brighton, for one has significant rainfall for most of the year, even in the driest month, February, there is still a lot of rainfall. This is the number one reason you’d need to have temporary roofing for your project. We provide temporary roofing systems for domestic, industrial and commercial applications. Our installations are highly efficient in covering any type of building newly erected. Our roofing systems offer high water resistance and are suitable for very harsh weather conditions. We can work with you to understand your needs and provide excellent designs at very affordable prices. You don’t have to worry about the stability and strength of the roof throughout your project because like all other scaffolding solutions we provide, our temporary roofs meet the expectations of the National Access and Scaffolding Confederation and Health and Safety Executive. We are also compliant with all industry standards. A temporary roof is a sheeted structure, usually of scaffolding, designed to protect specific areas from weather, dust, or construction debris. The interior area of your construction or refurbishment project would be kept unaffected by weather conditions like rain and heavy winds. Whatever the weather condition for the time of the year you’re working in, our temporary roofing solutions can bridge the gap a bad weather would create and keep your project running according to the intended time frame, if not ahead of it. So, not only would you not have to worry about the damage from harsh weather and other elements, you also would be able to keep work going beneath the covering. It could be erected on the top of a building, a ground base or an extension of a building; side or all round as needed. Depending on your roofing needs, we could provide a full roof which is ideal for total weather covering or environmental containment. We could also provide canopy roofing which is ideal for construction activities on the exterior of the building such as rendering. 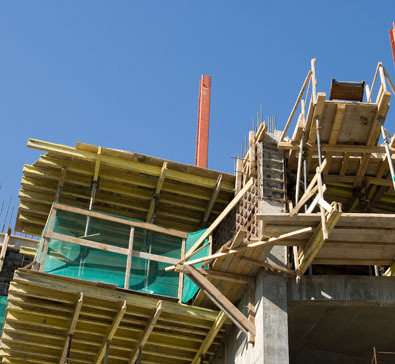 There are also a wide range of options you can choose from, such as fully waterproofed roofing protection, fully sheeted walls or side skirts, tilts, well-built wood based constructions, and even aluminium and steel installations that can meet whatever requirements your construction experts need, all dependent on your project requirements. If you’re not very sure of the exact kind of temporary roofing you may need, we can sit with you and draw up the most ideal plans for your project. We have experienced personnel and qualified draughtsmen in Brighton, who can create temporary roofing designs to fit your requirements because we are aware that roofing structures and needs vary. All we’d have to do is sit with you or your team to work out the best ways to provide the covering solutions you need. Temporary roofs are a great option for construction or refurbishment projects. They are often used to create water and weather protected covering. A lot of things can happen to set a project back financially or with the schedule. It could be sudden bad weather that may lead to some form of damage that could cause you to spend money and put your project behind schedule. The great thing about temporary roofs is that for the quality of shelter they provide, they are also quite easy to set up and dismantle, making them an easy option to fit into whatever time schedule you require. 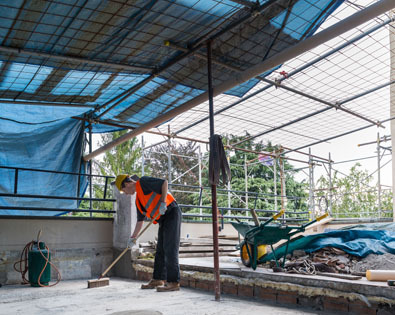 So, you don’t have to worry about setting your project back in terms of time; you’d have a temporary roof set up for your ongoing project or removed from your project by our qualified staff in Brighton in no time at all. They are flexible and so they can allow for certain sections to be removed for reasons such as installation. This makes temporary roofing an ideal option for both residential and commercial projects. With temporary roofing, your project can be protected from high winds, heavy rain, sleet and snow. This would go a long way towards cost saving because there would be no damage to your equipment and other materials, ultimately removing repair and replacement costs. Not only would you be avoiding damage, you would have a more controlled environment for people to work in. this would work for whatever your schedule. A controlled environment could mean a dry and comfortable working environment regardless of the regularly wet weather in Brighton, ensuring that productivity is as high as needed. It could also mean you can meet specific temperature or humidity levels to achieve your project needs. Temporary roofs can fit a wide range of roof spans so you wouldn’t have to worry about them being too wide or too narrow to fit your project size. They can be stand-alone designs or form parts of large scaffold designs. If needed, designs can be made to fit your project size. 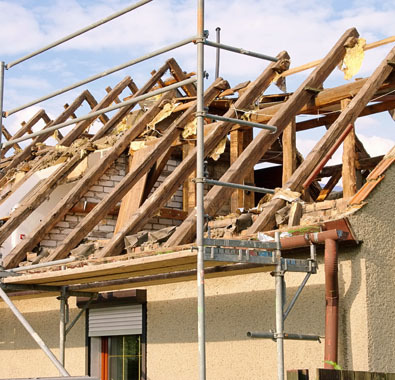 If you’ve had damage to your building after severe winds, heavy rains and so on, using temporary roofing can reduce further damage while you weigh the damage done and decide on the right course of action; repair or replacement of the affected area. In cases where a little damage could deteriorate into a bigger problem if left exposed, a temporary roof would save you a lot of money and buy you time. With the right temporary roof, you can be certain it is a safer addition to your project than traditional methods. In some situations, the site itself may not need a roof, but one could be beneficial to your workers, because factors such as wind, rain and low temperatures in Brighton could be harmful. An exposed roof could also present a burglary risk. We have provision for regular safety checks during the use of the temporary roofs and this ensures that quality specifications are met. We can erect temporary roof scaffolding to fit whatever kind of project you have. We also provide custom made temporary roofing solutions regardless of the nature of your project, new building or renovation. With our vast experience and knowledge of the market, you can be sure we will only use materials of the highest quality. While giving you the best solutions for your temporary roofing needs, we will make sure you get the best prices as well. If you have a budget, we can advise you on how well to work within it. You don’t have to worry about any logistics, we take care of all obligations concerning the assembly and removal of the temporary roofs we provide. All you have to do is make payments as needed and supervise the work as it progresses. All of our personnel are well trained, experienced and highly dedicated towards lasting customer satisfaction through safe and reliable service delivery. We are constantly improving our services to meet the growing needs of our clients and prospective clients alike, which is why we make all efforts to have open communication lines with all our clients, so feel free to contact us about any questions or concerns you have. If you need temporary roofing and you’re in Brighton, be sure to get in touch with us. What is a “Wet Patch”? A wet patch acts as moisture control. A good one of high quality can stick to wet surfaces and keep out moisture. It has setting temperatures of above 5 degrees Celsius and is ideal for localized damp or wet areas to act as a temporary seal. It can be used in any kind of weather; dry, hot, wet, or cold. A wet patch can be used for holes and cracks even in the rain or under water. Leak stops are temporary solutions designed for flat rooves. If there is a flat roof leak, a leak stop is applied to the area affected. The material is powdery at first and when it touches the water, it uses the water path to carry itself into the hole or damaged space in the roof. At this point, it solidifies and acts temporarily as a plug or dam, keeping water out. It can be tricky, however, depending on the size of the hole or how serious the problem is. Leak stops general last a few months and so the need to find a more permanent solution is important. What should I look out for when hiring a temporary roofing provider? You can start by making sure they are registered and licensed to provide temporary roofing solutions. You also want to know about how qualified their staff are. If you’re not satisfied with the answers you get from them, a good way to check how good they are is ask questions about them. Hopefully, they’ve left good lasting impressions and can be recommended by people. This would also help if they deliver poor services; you would know to find more reliable service providers. The National Access and Scaffolding Confederation and Health and Safety Executive has expectations regarding temporary rooves. There are also important industry standards to be met. You can ask about their procedures, safety regulations, routine checks and inspections, all of which you can weigh against industry standards before making any major decisions on your project. Can I erect a temporary roof myself? When it comes to roofing and related things, it is best to let it be handled by professionals. Even roofing repairs ought to be handle by professionals. Trying to erect a temporary roof yourself may cause an accident or increase the damage you may be trying to cover. Ensure to seek professional opinion and if it is something you can handle yourself, then they would advise you on how best to go about it; best resources and safety precautions you would need to take. How would I know if there is a problem with the temporary roofing system installed for me? Other than obvious pointers like a leak during rain, a hole or a tear in the roofing system, you can ask your roofing provider to give you a list of things to look out for that could be signs of a problem with the roofing system. It would also help to know what you or others working within the area could do before the professionals arrive. You do not always have to wait until you see an obvious problem or a possible problem listed on such lists before you reach out to your roofing providers if you feel there might be a problem. If you notice anything at all out of place or strange with the temporary roofing system, give them a call and have them come look at it. Does it take long to dismantle a temporary roof? No, it does not take long to dismantle a temporary roof. Just as you can have a temporary roofing system up in no time, you can also have it taken down in no time. Dismantling is best done professionally, so do not attempt to do it yourself. Does it take long to erect a temporary roof? No, it doesn’t take long to erect a temporary roof, which is why it is a preferred option. They can be set up in very little time, so, you won’t have to worry about waiting for a long time before you can continue with your project. It is advisable, however, to get an estimated time frame from your service provider so that you can fit it into whatever plans you may have. The entire process, even with any delays, is still not time consuming at all and in some cases, would require little input from you outside of supervision. Can I have temporary roofing for just specific parts of my building? Yes, you can. Temporary roofing is not always for just full covering. While this can be provided and has its benefits, if you need to cover only specific areas of your building, that can be done as well. You only need to discuss your needs with your roofing solution providers to know what can be and what cannot be done. Do I have to dismantle the temporary roof myself after I am done with it? No, your temporary roof provider should take care of all of your assembly and dismantling needs. Even if you do not use the roof for as long as initially estimated, it still would not be your job to take it down. It is also important that you do not attempt to do it yourself so as to not endanger lives and equipment. Can work go on beneath a temporary roof? Temporary rooves are not only beneficial because they provide weather and waterproof. They are also beneficial because they provide well protected work spaces as well. People won’t have to work exposed to bad weather. They won’t also have to suspend work in such situations; you could have a dry working area and improve productivity levels. Just ensure that you educate anyone working beneath a temporary roof about safety precautions they would need to follow. What if I need to uncover part of the temporary roofing during my project? There are many flexible temporary roofing solutions to choose from. If you think you’d need to make such changes during the course of your project, you can discuss it with your temporary roofing provider to figure out how best to go about it. Do not attempt to do it yourself at any time, to avoid accidents and expensive damage costs. What if my project is really big? Big or small, temporary roofing solutions are available to a wide range of building sizes. Whether the project is residential or commercial, you can be sure to get a solution to fit its size. Even if you have an unusually big or small project, there would be various options available to you, including designing a custom made temporary roof to fit your need. Don’t worry about the size, just talk to the right people to help you make the right choices. What if I am not sure about the exact temporary roofing solutions I need? Every project has different needs in various areas including temporary roofing. There really is no one size fits all plan so, not being sure is no problem at all. You can discuss the kind of project you’re doing and its requirements with experts who would then help you figure the best temporary roofing solutions available to you. You should ask questions, if you have any about what sort of protection you’d be getting with their temporary roofing solution, what your obligations would be at different stages like assembling and dismantling. If you have any doubts at all, you can always get a second and third opinion if necessary. How long can I use a temporary roof for? Temporary rooves are as the name suggests, temporary. They can be used for a couple of months, or at most, one year. Whether they last more than a few months, however, depends on the weather conditions they are exposed to. Environments with harsher weather conditions are bound to wear out temporary rooves faster than environments with more stable or pleasant weather conditions. The nature of your project could also be a determinant in how long you could use a temporary roof; the kind of work done beneath the covering or internal safety requirements you may have to follow. If your project will be taking a long time, you could look into very affordable replacement options. A reliable service provider would have routine safety checks to make sure your temporary roof meets safety requirements at all times. What are the benefits of a temporary roof? Provide a protected working environment for your staff; protected from harsh weather condition that could endanger their health. They are cost saving if you’re covering a damaged area while working out repair plans. Provide protection for equipment or tools that could become damaged if exposed to the elements. Time saving because work can still go on underneath them. They are a good way to protect your project while buying time if you’re still sourcing funds for a permanent solution. Can be used for full covering or partial covering as needed by your project. Temporary roofing is a covering that is used to protect a building from damage that could be caused by rain, high winds and other harsh weather conditions. When water, for instance, gets into buildings, it could result in expensive repairs and replacements which could be avoided with temporary roofing systems. They are also used for quick and effective leak stop measures in cases where a repair or replacement is already needed. 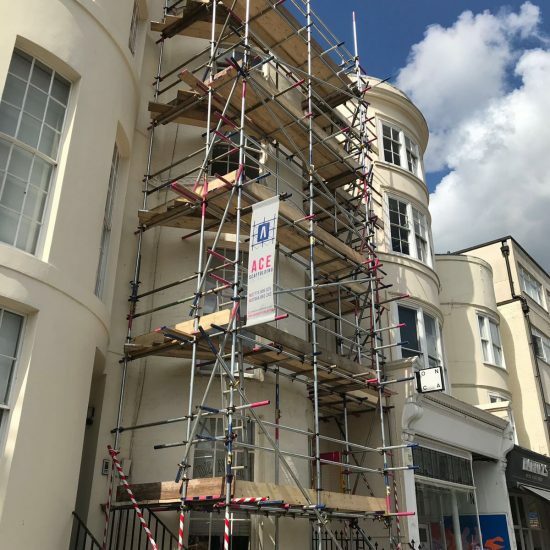 Ace Scaffolding offers Temporary Roofing Scaffolds in Brighton, East Sussex, a large town located in South East England. 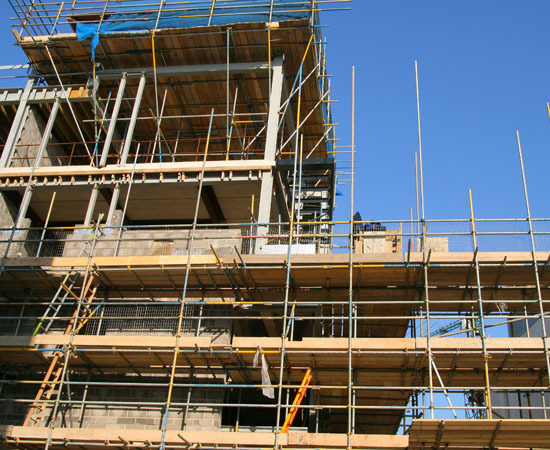 A variety of businesses including Ace Scaffolding make East Sussex and Brighton their home. Commonly used nicknames include Blightey & Brighthelmstone. Ace Scaffolding’s Temporary Roofing Scaffolds area in the City of Brighton and Hove also includes Mile Oak, Moulsecoomb, Hollingbury, Hollingdean and Hove. Last in order of mention, Ace Scaffolding’s Temporary Roofing Scaffolds cover the Brighton Municipality along with Stanmer, Bear Road area and Brighton Marina.